BARBARA KLEIN: Welcome to THE MAKING OF A NATION -- American history in VOA Special English. Democrats protested that the Republicans had stolen the election. Yet they agreed to accept Hayes as president. In exchange, Hayes and the Republicans agreed to accept Democratic Party policies on several issues. Hayes's administration would deal mainly with national -- not international -- problems. STEVE EMBER: Republican Party leaders criticized President Hayes. Anti-slavery groups also criticized him. They said former black slaves in the south had gained a lot under Republican rule. Now, they said, these black Americans would lose everything. Hayes did not agree. He had received promises that the new democratic state governments would protect the rights of black Americans. It was not to be. White Democrats kept political control in some southern states for many years. They often denied civil rights to black citizens. Only with the rise of the civil rights movement in the nineteen fifties would the situation begin to change. RICHARD RAEL: After becoming president, Rutherford Hayes announced that he would serve just one term. He wanted to make serious reforms in the federal government. This would be easier to do if he did not have to worry about getting re-elected. Hayes started by changing the system that employed people in government jobs. Party leaders usually had great power to fill government jobs. They used the jobs to reward loyal party workers and to increase their own political strength. President Hayes demanded that federal jobs be given to people because of their abilities, not because they supported a politician. STEVE EMBER: At that time, the best jobs were with the customs service of the Treasury Department. The people who collected customs -- taxes on imports -- could keep part of the money they collected. President Hayes took action against the customs service office in New York City. One of the men removed from the job there was James Garfield. Garfield would later become president of the United States. Hayes also banned all federal workers from taking part in political organizations, conventions, and campaigns. And he said politicians no longer could demand campaign money from federal workers. RICHARD RAEL: Rutherford Hayes showed more political strength during a nationwide railroad strike. The strike began during his first summer as president. For several years, the nation had suffered from a serious economic depression. Three million people were out of work. Factories and businesses reduced the pay of those who still had jobs. Workers with the Baltimore and Ohio railroad protested. They took control of many areas along the railroad. They refused to let the trains move. The strike spread to other railroads. In some places, the strikes turned into riots, and the riots became violent. Some governors ordered their state armed forces to intervene. The state forces were not strong enough, however. So the governors asked President Hayes for help. He immediately sent federal troops to troubled cities. The troops stopped the riots and ended the strikes. STEVE EMBER: Another issue during Hayes's administration involved a railroad in the western United States. It was both a labor problem and an immigration problem thousands of Chinese workers had been brought to America to help build the Central Pacific Railroad. After the railroad was built, many of them remained. Most settled in California. Others came from China to join them. These immigrants competed with white workers for jobs. Whites protested, because the Chinese agreed to work for less money. They said this kept wages down for all workers. RICHARD RAEL: The white workers asked Congress for a law to stop Chinese workers from coming to the United States. Members of Congress from both parties wanted the support of these voters. So they quickly passed a bill that made it much more difficult for Chinese citizens to come to live in the United States. The bill said the president must cancel part of a treaty between the United States and China. That part of the treaty permitted citizens of each country to settle in the other country. STEVE EMBER: President Hayes vetoed the bill. He said the United States had proposed the treaty. So, he said, the United States could not change it without agreement from China. Hayes did agree, however, that some action was necessary. So he opened negotiations with the Chinese government. He won an agreement to limit the number of Chinese who could enter the United States. RICHARD RAEL: During the administrations of Andrew Johnson and Ulysses Grant, Congress had weakened many powers of the president. Congress had become the strongest of the three branches of the American government. 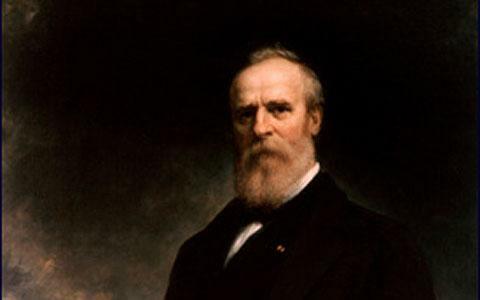 Throughout his administration, Rutherford Hayes worked hard to strengthen presidential powers. STEVE EMBER: Congress considers a bill the president believes is necessary. Then it joins that bill to a measure the president would veto if passed separately. The extra measure is called a "rider" to the first bill. To get the bill he wants, the president must accept the "rider," too. President Hayes refused to sign any bills with riders. So the Congress during his administration stopped using the method. Congresses since then have used it successfully. "I left this great country prosperous and happy. I left the party of my choice strong, victorious, and united. In serving the country, I served my party. "He died in eighteen ninety-three. STEVE EMBER: Hayes was right in saying that the United States was strong and prosperous. The late eighteen-hundreds were a time of growth for the nation. They also were a time of expansion into new territory. BARBARA KLEIN: Our program was written by David Jarmul. The narrators were Steve Ember and Richard Rael. Our programs can be found online with transcripts, MP3s, podcasts and historical images at www.unsv.com. You can also follow us on Twitter at VOA Learning English. 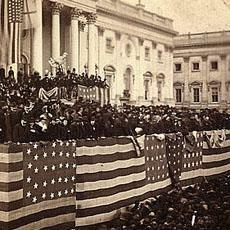 Join us again next week for THE MAKING OF A NATION -- an American history series in VOA Special English.